I couldn’t put them down. And I couldn’t quite read them either: Story after story of families separated at the southern border: Dusty-kneed children made to stand trial in immigration court when they were barely old enough to stand, tales of empty-armed parents and tear-stained toddlers, wordless and alone. I wanted to read more, to know more, and to do something—and yet I couldn’t even read to the end of a single account. The print and pictures would begin to blur in a haze of stifled grief and rage. I floated in this paralysis of silence and inaction for months, as the headlines roared forth, then slipped from front pages to the recesses of our collective consciousness. This wasn’t just the now-familiar overwhelm of a liberal with a beating heart in these troubled times. It was a symptom of my post-traumatic stress. That’s because I crossed a border and lost my child in a courtroom, too and these stories wake in me emotions I’ve worked hard to keep at bay. I know that the losses these stories chronicled: parents missing their baby’s first steps, first words, trills of laughter they couldn’t hear, and tears they couldn’t wipe from their child’s cheek. And worse, I know those losses are only the beginning of more agonies yet to come. Even the occasional headline claiming that families are being reunited don’t offer me comfort. Twenty-six years after my separation from my daughter, I can’t be lulled into believing that the pain—and painful repercussions—will stop even when parents hold their children close again. My story began when I decided in my twenties, in love with another woman, to start a family even though I knew that the law was against us. I was our daughter’s nonbiological mother, meaning that my partner birthed the baby we vowed to raise together. Nearly five years later, after our relationship ended, my ex decided to punish me by taking our daughter out of my life. We faced each other before a judge and I left the courtroom empty-handed. It was 1992, and I was dismissed as a “biological stranger” with no parental rights, and no reason for the judge to even consider my case. Although the court refused to see me, to my daughter I was Ima (Hebrew for mother), one of the adults she most trusted and counted on to feed, bathe, clothe and care for her—and to protect her. But I couldn’t do that. Instead, her other mother, who was diagnosed with mental illness, and who therefore was sometimes unable to attend to our daughter’s most basic needs, won sole custody. For years I couldn’t see my daughter, get news of her, touch her, hear her, smell her, hold her, scold, praise, cuddle, or lift her. I’m not claiming there’s an equivalency between my experience and the parents whose pictures I can’t turn away from—and can’t bear to look at, either. Our lives are different in so many ways given my privilege of race, economic class, and citizenship. But a heart breaks the same way in any language. 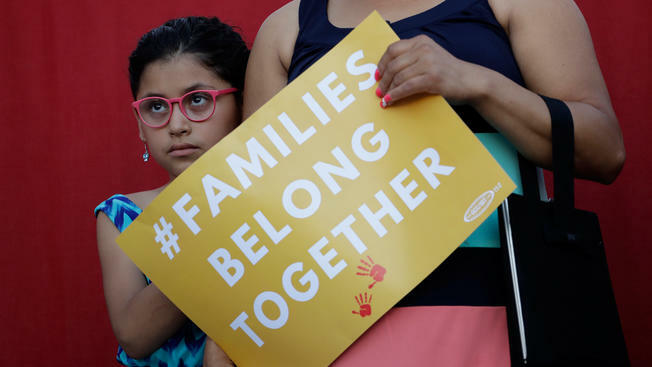 Like the parents who are suffering, have suffered, or will suffer from family separations at the border, my blood, my bones, my cells, know the fury, powerlessness, disbelief and claustrophobic fear of having your child taken from you. I know the effects of politically-motivated desecrations of a holy, human bond between parent and child. But unlike those whose skin newly tingles from the missing weight of their children, I have lived for years into and then decades through these bleak absences. I was reunited with my daughter as she was about to cross into the “double digits,” just before her tenth birthday. But that doesn’t mean our story has a simple, happy ending. Now she’s entered her thirties, and we each carry our version of PTSD from that time. We have a close relationship, but we carefully sidestep the crater that’s dug into the center of our shared story. The slightest tinge of pain in my daughter’s voice as she references those years apart can upend my world for days at a time. Studies show that children who were sent to live away from their parents in order to protect them from the Nazis during World War II fared worse than those who survived by fleeing, hiding out, and enduring the ravages of war with their parents. My daughter’s grandmother, now in her eighties, was one of those children, and speaks tearfully to this day of the scars of having been taken from her parents during those months—even though in her case it was intended for her own good. Separation of children from families, even with the best motives, can be worse than war itself. I, like any parent who has been separated against their will from their child, know this. Those who study the science and psychology of the human mind can attest to it. The damage done to these babies, children, and their parents is beyond measure. But there is no turning back. At the very least we must listen to the beating thrum of humanity inside ourselves and refuse to cross into the hell of indifference. We can breathe and feel the pain and acknowledge our shared humanity. Just for a moment at least, before we turn the page. Just for a moment, which could be enough to inspire us to take the next step.